Happy hour is the perfect time to get some drinks and a bite to eat with friends. Bethesda has many delicious restaurants and some of them offer top-notch happy hour food and drink specials. We’ve compiled the top happy hour choices in Bethesda for your next night out. Black’s Bar and Kitchen, located on Bethesda Row, has your typical happy hour on Monday-Friday from 3-7pm, but also has a Saturday happy hour from 12-6pm and a Sunday night wine special. For drinks, try a $7 martini, $6 wine, or $5 beer from the rotating selection. On Sunday branch out your wine selection, glasses are all half-priced. Oysters are the happy hour food of choice, with 2 for $2.25. Mussels, calamari, and flatbread are all discounted during happy hour too! 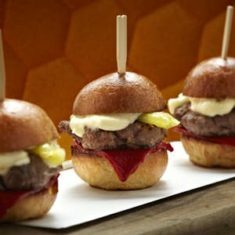 Delicious sliders at Jaleo – photo from Jaleo’s website. Forget happy hour – this popular tapas destination has sangria hour! From 4-7pm Sunday through Friday and Saturday 10pm-Midnight, drink delicious $4 sangria and beer. While you’re drinking, snack on a selection of $3-$6 discounted tapas, ranging from goat cheese and orange slices to traditional sauteed shrimp with garlic. Locals claim the salmon tartare tapa is the best item on the menu (and it won’t break the bank at $3). Visit this classy French Bistro during happy hour for half-off all craft cocktails, beer, and wines by the glass and hors d’oeuvres! This special only applies in the bar area on Monday through Friday from 4-7pm, so make sure you arrive early. Hors d’oeuvres start at $5 a plate – options include pate, salmon burgers, steak sandwiches, or Belgian fries. Raving reviews are for the extensive wine selection, oven-warm bread, and even occasional live jazz. 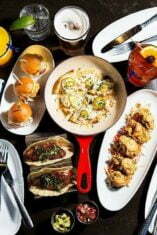 Tapas are a theme with excellent happy hours in Bethesda! Stop by Guardado’s Tuesday through Friday from 3-7pm for $4 Sangrías, Mojitos, Margaritas, and Martinis. There are plenty of vegetarian tapas here, including the grilled portabello mushroom topped with goat cheese and basil oil. Have no fear meat and seafood lovers, there are plenty of options for you too. Try the Gambas Chorizo (shrimp and sausage) or Pan Seared Tilapia – or both, the tapas are only $5. Are you looking for a deal on fresh seafood? PassionFish Bethesda is your destination! For $5 a plate, try the blackened fish tacos, crab and shrimp spring rolls, or crispy fried oysters. Food item specials run Monday through Friday from 3-6:30pm, Saturday from 4-6:30pm, and Sunday 4-9pm. Specialty cocktails, beer, and wines from the happy hour menu are also $5 at the same times – except the drink cut off is 7pm instead of 6:30pm on weekdays. Sit on the patio during fair-weather or the high-bar indoors on rainy days. If you’re looking for a less crowded atmosphere, try Vino Volo during happy hour Monday through Friday at 4-7pm or Saturday 10pm-Close. While Vino Volo specializes in wine, the $5 truffled popcorn and $8 mini pizzas will also make a lasting impression. Wine flights run from $6-$15, and once you find your favorite, have a full glass for $5-$6. This family-owned and operated Italian restaurant in the heart of downtown Bethesda is a cozy place. The full bar and reasonable prices make it a good choice at any hour, but Monday features half-priced bottles of wine and Tuesday features $5 martinis. These deals are good all night – defeat the Monday blues by pairing the homemade gnocchi with a Chianti Classico Italian wine. 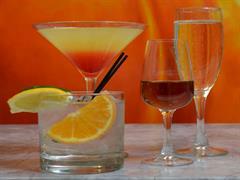 Have a discounted drink during Persimmon’s happy hour – photo from their website. On of Bethesda’s best-kept secrets is located right outside downtown. If you haven’t been to Persimmon Restaurant’s happy hour, you’re missing out! At the bar on Monday through Friday from 5-7pm, enjoy discounted appetizers (known by names like bistro bites and happy meals) for as low at $2. The $3 tuna and avocado tartar bite comes highly recommended. While eating, have a half-priced beer, $8 wine, $7 house cocktail, or $8 house martini. Another choice for seafood lovers is Mussel Bar & Grille. Each day from 3-7pm get $5 wine, $3 can beer, $2 off draft beer, $5 truffle cheese fries, or $6 chicken wings. For $1 oysters or $5 cava, come on Tuesday from 4-10pm (the cava deal runs until close). But don’t worry, oysters are only $1.25 during happy hour on other days. Sunday through Thursday there is another “late night” happy hour from 9:30pm-close (it doesn’t include oyster deals). Looking for brunch ideas too? Read our top 10 list for brunch in Bethesda, Maryland.